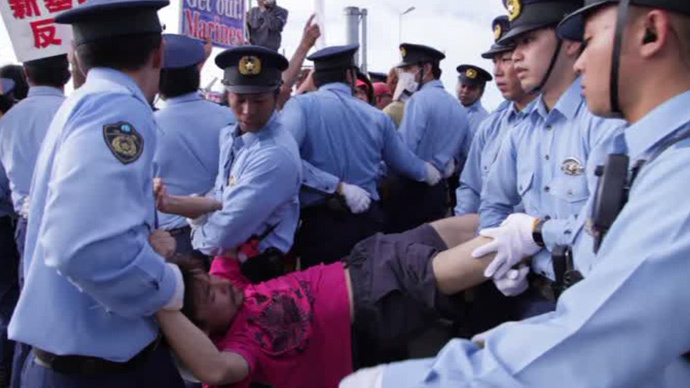 Scuffles have broken out on Tuesday between police and protesters who rallied outside a US base on Okinawa Island. The rally is the latest in the series of protests against the planned relocation of a US military base in the Japanese prefecture. “Get out! Don’t kill! Don’t die”, “Don’t destroy nature” and “Get out Marines” read placards held by the dozens of activists near US Marine base ‘Camp Schwab' in northeastern Okinawa. Several police officers were deployed to push away the demonstrators, Ruptly video shows. They also dragged around some of the protestors who were waving banners and shouting into bullhorns. The rally comes a day after Okinawa’s Governor Takeshi Onaga demanded flights of all US tilt-rotor Osprey aircraft be suspended following a fatal crash in Hawaii. The MV-22’s crash renewed safety concern among Okinawa residents. “From the [Okinawan] residents' point of view, Osprey deployment is not acceptable to begin with,''Onaga told a televised news conference, as cited by AP. Thousands have been marching in the prefecture and across Japan since Friday against the planned relocation of a US military base in Okinawa. The protesters say the Japanese government is turning a deaf ear to Okinawa locals. Sunday march gathered about 35,000 people in the prefecture that hosts nearly half the 47,000 US troops based in Japan. The US Marine Corps’ Futenma Air Station, in the heavily-populated city of Ginowan, has been a cause of tension between American troops and locals for decades. Tokyo authorities want to shut down the base and open a new one in the more remote town of Henoko, in the center of Okinawa. However, the majority of prefecture residents want the construction of the replacement base to be scrapped. In March, Onaga demanded that the underwater survey needed to build an offshore airstrip for the new base be stopped, citing environmental damage. He met Defense Minister General Nakatani in May to discuss the relocation plan. However, they failed to reach a solution.